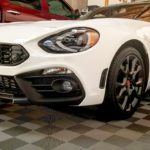 One of the most common questions we receive is “what can I use to clean my wheels? No matter what I use, I can never get the wheels clean. Well, you’re in luck – today I will reveal my secret to you – how we effortlessly clean wheels to 100% every time. For the past two years, we’ve been using a product that is safe for all exterior car surfaces. This product is user friendly, highly effective and non-acidic. It works by dissolving embedded brake dust and other ferrous materials – materials that quickly build up on the surface of your wheels as you drive. Brake dust can be especially difficult to remove using conventional cleaners, as it bonds with the surface it lands on. This means that it is easier to literally MELT the iron particles away, rather than physically remove them. 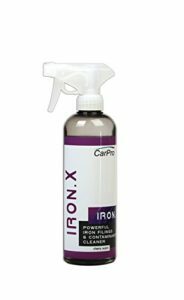 I introduce to you – CARPRO IRONX! Ironx was formulated with the highest content of active ingredients on the market. 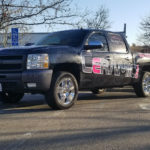 We use it in our processes to clean paint, wheels, windows, and every other exterior car surface. It works quickly and safely – kind of like an extra set of hands. When used on a regular basis, it allows us to clean wheels without even touching them – yes, you read that correctly. We spray it onto the wheel, wait three minutes, and spray the wheel off with a strong stream of water, from a pressure washer or hose. Don’t believe us? Try it out for yourself. I guarantee you’ll never buy another wheel cleaner.